Marseille Provence Airport is the international airport of Marseille. It is, next to Nice Airport, an important port of entry for tourist for the French Mediterranean coast. Distance from city center: 30 km. Which airlines fly to Marseille Provence Airport? There are more airlines flying to Marseille Provence Airport. See here for a complete list of airlines flying to Marseille Provence Airport or look for flights to Marseille. How many runways and passenger terminals does Marseille Provence Airport have? The airport has two terminals, the main terminal (MP1) is used for both domestic and international flights, and the new MP2 terminal for budget / low-cost airlines. Where is Marseille Provence Airport located? Marseille Provence Airport is located 30 km northwest of the city center. How to get from the airport to Marseille city centre by public transport? Shuttles buses for Marseille city center, the Navette Marseille Aeroport bus, depart every 15 minutes from outside Terminal 1: on platform 1 between hall 1 and hall 3/4. The ride into the city will take about 30 minutes and will cost 8 euro for a one-way ticket. Tickets can be bought at the booth or online. You can also take a train to central Marseille but you would need to take the free Airport Shuttle bus first. This bus leaves every 20 minutes from platform 3 outside Terminal NP1 for the Vitrolles Aeroport Station and takes about 5 minutes. From this station several direct and non-stop trains depart every hour to Marseille central station (Gare St. Charles). A train ticket costs 5.10 euro and can be bought at the booths or vending machines. See for tickets and schedule: buses: navettemarseilleaeroport.com . How much does a taxi cost from the airport to Marseille city centre? A taxi to central Marsille is about 50 euro, but a bit more in early morning and late evening. 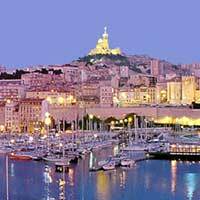 What are popular destinations from Marseille Provence Airport? Need place to stay in Marseille?